This chic and sophisticated capital city is a fascinating mix of old and new, with futuristic skyscrapers rubbing shoulders with Hindu temples, Mosques and Chinese shops. It is a colourful city and by day the pristine streets are ideal for shopping and sightseeing, and by night you can savour a romantic dinner in the great value restaurants or enjoy a cocktail in one of the lively bars. 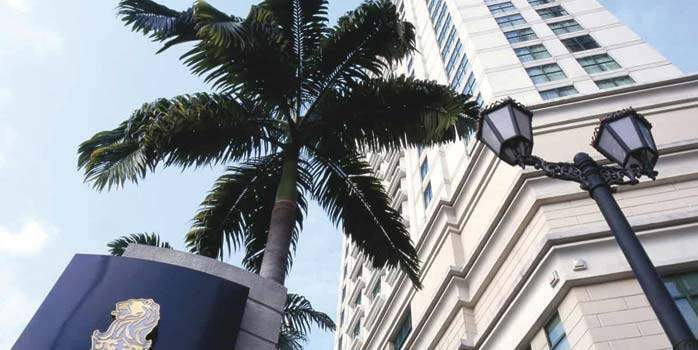 The hotels we feature have been chosen due to their high quality as well as their great location allowing you to enjoy this vibrant, exotic city. For more details on the courses see under the golf tab. You’re in for a long day if you can’t hit straight. Tight, undulating and spectacular, this tough course is a true challenge.Some 3000 feet above sea level in the Genting Highlands lies the Awana Genting Highlands Golf & Country Resort, a tough course which benefits from some spectacular views amidst the jungle-clad hills.This is an unrelentingly tough course, thanks mainly to the undulating tightness of the holes. The fairways are often as narrow as about 10 metres, so if you’re having one of those days when you just can’t hit straight you’ll be in a while heap of trouble. Not only that, you’ll also spend a fortune on balls, as anything offline will stay lost, either in the thick jungle or the occasional water hazards that surface memorably on the 4th and 15th, both par-3s involving forced carries over ponds.The undulating nature of the terrain means that even straight shots can end up in trouble, with gravity working its malicious magic. 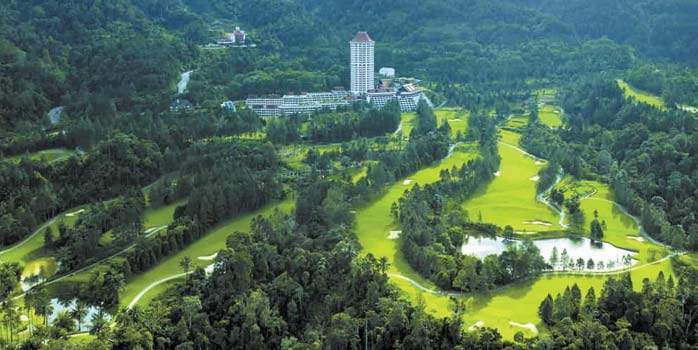 However, these spectacular elevation do provide for some memorably stunning sights, especially from the tee of the par-4 3rd where you can see the Genting Highlands hotel some 4000 feet above you.This is a thinking man’s course. There are plenty of holes that dangle the risk-reward equation temptingly in front of you, but before reaching for the big dog and trying to cut the corner, you should know that the percentage game lies on a more conservative strategy despite the extra distances that are possible at this altitude. You probably won’t be able to resist from some of the elevated tees, but consider yourself warned! Whichever route you take to get there, the greens will test your reading skills to the max. Not only are they pretty fast, the are viciously contoured and occasionally tiered, and your success or otherwise with the putter will probably have the biggest bearing on your score.Away from the course there are facilities for massage, sauna, snooker, tennis and swimming, as well as decent accommodation and a range of restaurants serving local and international cuisine, so even if your scorecard is a mess it’s easy to end the day content. Overall, a tough course that presents a challenge that is hard to resist. Two excellent and very challenging championship courses that somehow don’t quite justify the green fees. A half hour drive from Kuala Lumpur Airport lies Glenmarie Golf & Country Club, two championship courses often talked about as amongst the ten best in Malaysia. You certainly get a good impression driving up the huge driveway towards the impressive clubhouse. The Garden course, generally thought of as the easier of the two despite being longer has benefitted from a 2010 renovation which has improved bunkers, tee boxes and fairways. Home to a wide variety of flora and fauna, including the black and white swans that dominate the lakes, the open feel of the bowl-like terrain is undeniably pleasant. The opening couple of holes involve avoiding lots of water, but it’s not really par for the course (as it were) as there are only two further holes after this opening salvo where you have to worry about your ball getting wet. The main challenge comes from the elevation changes that make judging your approach shots to the large greens pretty tricky. If you can avoid the abundant green-side bunkers (there really are a lot of bunkers here), the lightning quick and undulating greens mean getting down in two tough. The Valley course is the more challenging of the two and danger lurks at every hole. Even the inviting looking drive from the 1st tee must be wary of the OB that creeps in from the right. The par-5 4th requires you to avoid a creek off the tee and then approach an island green, not the last time that you will encounter water hazards. Yet again it is the elevation changes that cause the most difficulty, as they lead to blind shots over ridges which you can get really wrong if you haven’t played the course before. This puts you somewhat at the mercy of the caddies who sadly, in our experience, weren’t up to scratch. We’ve heard reports that our experience wasn’t an isolated one, so you are maybe best off following your instincts off the tee and on the green. Unfortunately, this isn’t the only niggle. Golf carts are compulsory and as overpriced as the on-course refreshments. While the fairways and greens are in decent shape, given the green fee you can’t help but feel that it should be a cut above. 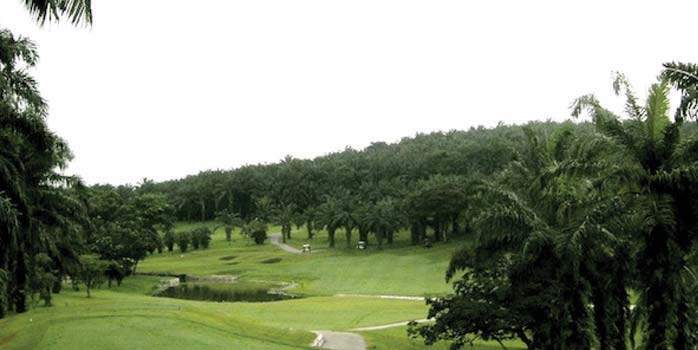 If you enjoy a challenge and budget it no issue, then a round of golf at Glenmarie Golf & Country Club will be an enjoyably challenging day out. You won’t shoot to your handicap first time round, and there is pleasure in coming back a second time with a better idea of how to play the blind shots. 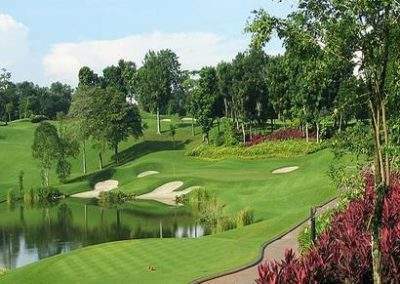 Even if it may not deserve the accolade of being Malaysia’s toughest course, this is still a hugely challenging course in excellent condition; a third, shorter nine, is perfect for seniors. Recently voted the most difficult course in Malaysia and yet somehow still accessible to less accomplished goflers, the Kelab Golf Perkhidmatan Awam boasts 27 championship holes just outside of Kuala Lumpur. The Lakes and Lakes nines make up the standard, 18 hole championship course, and most golfers will elect for this combination rather than include the much shorter Forest nine. From the elevated first tee you get a great view of the whole course stretching before you beyond the wide inviting first fairway which dives down and then climbs up to a small green. This undulation is typical of the course, and with fairways in excellent shape due to an ongoing maintenance programme, you can find your drives rolling quite a long way if you can catch the slopes. Suddenly, the green of the par-4 3rd becomes drivable, and the downhill 10th can help you add an extra 50 yards to your drive. The greens are also in superb condition, offering consistent roll. This is perhaps the only consistent thing about the greens, which are a mixture of large and small, flat and contoured. Many are surrounded by an extensive bunker complex, but the sand traps are in such wonderful condition that you won’t mind ending up in one too much. There are no drainage issues and the sand is so soft that your view after a shot will be an explosion of fluffy white particles. It’s probably the rough that does the most to earn Kelab Golf Perkhidmatan Awam the title of the most difficult course in Malaysia. You’ll occasionally find the grass too thick to make much progress, and the jungle that borders the course, particularly on the Hills nine, is far too dense to recover from. The Lakes nine substitutes jungle for water (appropriately enough) with errant shots running the risk of a water grave on several holes, but overall it is easier than the Hills nine, and long-hitters should be able to play to their handicap. Beginners will struggle however, especially given the length of the course, although everyone should have a go at the par-3s on the Lakes nine, which involve tee shots over water and a deep gorge respectively. Length is not really an issue on the Forest nine, which was designed for walkers and senior golfers and measures only 2666 yards. Nonetheless, what it lacks in length it makes up for with some devilishly difficult holes and plenty of trees that seem all too willing to send your ball off in random directions. While it doesn’t quite live up to the delights of the main course, it’s a useful addition to Kelab Golf Perkhidmatan Awam, where an enjoyable day’s golfing awaits. Like the sound of this course? Secure a tee time and take advantage of the discounted green fees on offer by adding Kelab Golf Perkhidmatan Awam to your Kuala Lumpur golf holiday. Amongst the best courses in the country, this attractive parkland course does well not to be overshadowed by its more illustrious sister course, and is highly recommended. The championship standard East Course at Kuala Lumpur Golf & Country Club, which lies just outside the city centre, was recently voted the 4th best course in Malaysia and stepping onto the tee and taking in the vibrant, parkland-style environment of natural grasses and wetlands that are home to a variety of wildlife, it’s easy to see why. This is not a course that can be bludgeoned into submission, instead placing a premium on intelligent golf as you negotiate the undulating terrain and numerous bunkers that pepper the perfectly maintained fairways and bordered the immaculate greens. The elevated tee boxes on several holes give you a good idea of the challenges each hole with throw at you, allowing you to plan your route to the green, and despite playing long at 7348 yards there is not always virtue in hitting as far as possible off the tee. With many fairways tightly lined with trees which can severely punish drives that veer off line, accuracy is at more of a premium. This is especially true of the opening holes of the back nine where OB comes into play. It’s a good idea to take advantage of the more easy going front nine if you want to score well, as the bunkers and increasing numbers of water hazards that you will encounter as the round progresses can easily mar your scorecard. While you’ll find perfect lies on the immaculately maintained Bermuda fairways, the rough that borders them is particularly thick, clinging onto your ball and very reluctant to let it go. This is equally true around the greens, meaning that chip-and-runs are out and target golf is the name of the game. It hardly needs saying that you’ll be in for a long day if you aren’t hitting straight – for example, at the tough par-5 16th, your drive from an elevated tee must avoid water on both sides. Both nines end with challenging approaches in front of the clubhouse, requiring an accurate long iron over a pond that menacingly protects each green. Many a scorecard ends on an ugly note. The recently refurbished clubhouse, which boast the graceful lines of Californian-Spanish architecture, is now outfitted with state of the art facilities and is a great place to enjoy a cool drink as you reflect on your round. For those taking a golf holiday in the area, a round on the East Course at Kuala Lumpur Golf & Country Club should be on your itinerary. 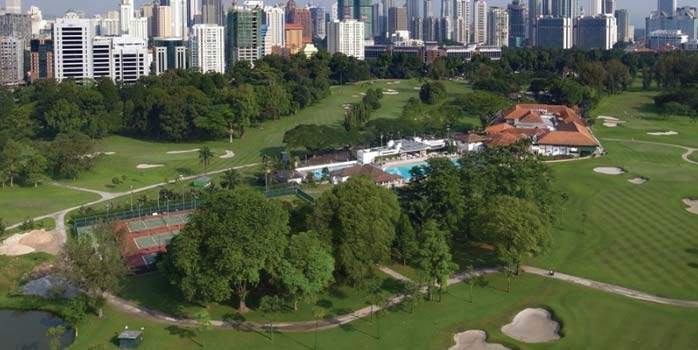 Kuala Lumpur Golf & Country Club’s (KLGCC) West Course is the longer and more challenging of two private golf courses at the club located near the heart of Kuala Lumpur’s sprawling city center. Designed by architect Robin Nelson and playing to nearly 7,000 yards from the tournament tees, the golf course is set among the Bukit Kiara hillsides. A cultural institution as much as its older sister course, the lightning greens and traditional layout mean this is a choice for the traditionalist. 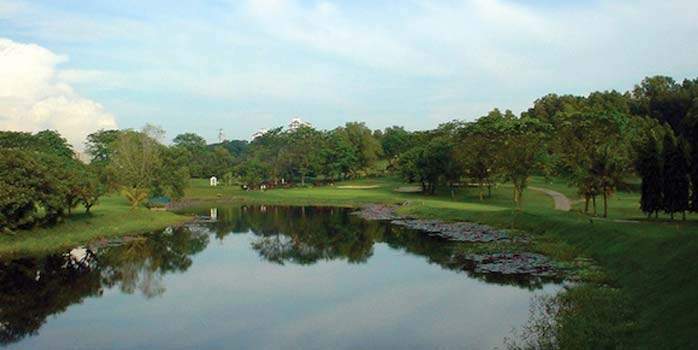 Dating back to 1893 and laying claim to be the founding father of golf in Malaysia, the Royal Selangor Golf Club remains today one of the premier golfing destinations in Malaysia. The New Course, which dates back to 1924, is wrapped around the front nine of its more renowned sister course over flat terrain dotted with 100 year old trees and man-made ponds. 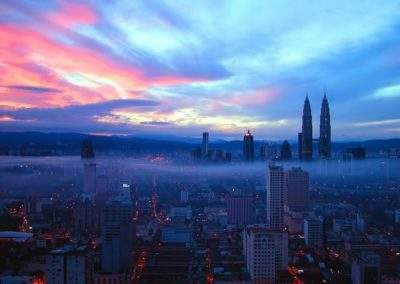 Added to the variety of wildlife, from chirping birds, friendly monkeys and wandering iguanas, it’s hard to believe you are just 5 minutes from downtown Kuala Lumpur. The course is as highly rated as the Old Course, and in many ways is pretty similar, the flat terrain enlivened by strong bunkering, but there are less bail-out areas, with the trees making some of the fairways pretty narrow. The slightly underwhelming fairways are compensated for by the fact that the table-top greens are seriously quick. You’ll be begging your (compulsory) caddy for advice before long. It’s a shame it’s so hard for them to advise you on how hard to hit the ball, as it is all too easy to putt it right off the green here. Were it not for the Petronas Towers that lurk in the background and give you the line for your drive on the opening hole, it would be easy to imagine that you were playing on a traditional home counties course, thanks to the ancient trees and parallel fairways and air of tradition that hangs over the course. There are no gimmicks here, just straightforward, quality holes like the enjoyable short 14th and the monstrous 18th, which plays at over 500 yards and requires your approach to avoid water on the right and a bunker right in front of the sloping green. It’s easy to see imagine the drama that can unfold here in competition. The staff are a great asset here, hundreds of them running around diligently doing their job – turn up really early and you will see them mowing the lawns in the dark with headlights on, ensuring that the course is in its usual immaculate condition.The clubhouse includes an excellent restaurant, plush locker rooms, swimming pool, gym, squash courts and snooker tables, and is a great place to spend some time being waited on hand and foot after a round. It also retains a tradition vibe – you can’t use your phone in the main lounge, which somehow adds to the old-school feel of the place. If you get the chance, a round on the New Course at Royal Selangor Golf Club comes as highly recommended as one on the Old Course. Despite lacking the wow factor, its a privilege to play on such a historic and exclusive course, and the greens are out of this world. Getting a round here isn’t easy, but if can it will be a traditional treat. 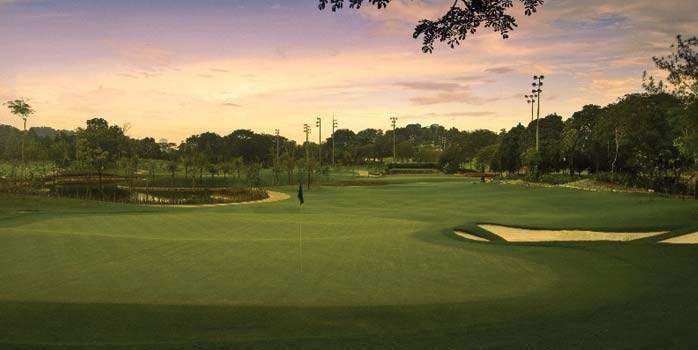 Dating back to 1893 and laying claim to be the founding father of golf in Malaysia, the Royal Selangor Golf Club remains today one of the premier golfing destinations in Malaysia. 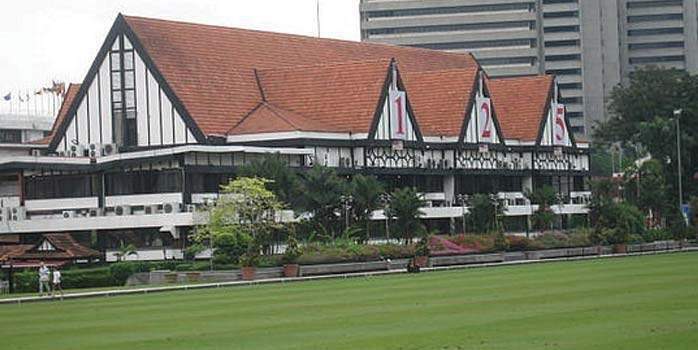 Its historic old course, which hosted the inaugural Malaysian Open and has undergone some impressive and extensive remodeling recently, is almost a cultural institution in itself. 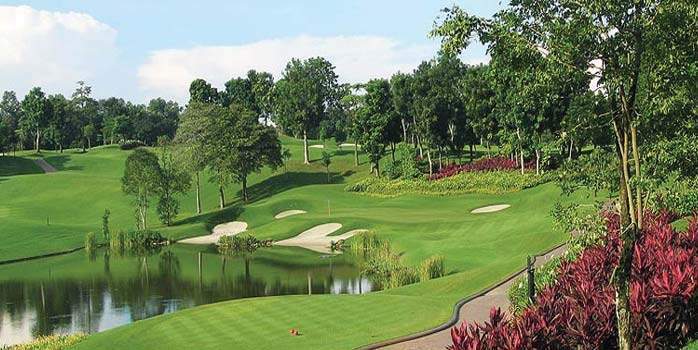 This most prestigious of Malaysian courses is a beautifully landscaped parkland affair that benefits hugely from the mature trees that you won’t find on the more recent additions to the KL golfing circuit. It’s pretty flat, and plays like a traditional course – parallel fairways, bail out areas left and right and an absence of OB stakes that mean there is a certain amount of leeway off the tee. While the Seashore Paspalum fairways are nothing particularly special, suffering from the odd bald patch, they do hold up well in the face of rain thanks to an excellent drainage system. The greens are amongst the best in the land, running very very fast and true. Most are table-top greens, meaning your approaches have got to be spot on if you want to be putting in regulation. The sheer speed of the putting surface can easily unnerve you, and once you’ve missed a couple of short ones it can be hard to recover your confidence. This is where the advice of the caddies comes into play – they are excellent, and very experienced, some having been at the club for over 40 years. You are well advised to listen to their advice. While its the excellent bunkering that causes most problems, the back nine introduces a series of water hazards over the closing holes to add an extra layer of difficulty, particularly on the signature 17th, a great short hole where you play over water to a raised green characterised by some maddeningly subtle undulations, and on the 18th where you must carry a substantial lake to reach the fairway. Overall, it feels a lot like the kind of traditional course you might find in the home counties in the UK, although the monolithic Petronas towers that look down on the course serve to remind you that you are far from the UK, and when you encounter the dozens of monkeys that call the woods next to the par-4 12th home you are left in no doubt that this is something a bit different. It’s best avoiding a slice here, as the local residents may be unwilling to return your shiny Titliest. To be honest, there aren’t that many holes that will give you that elusive ‘wow’ factor, but you genuinely have the feeling of being privileged to play on such a historic and exclusive course, part of a proper golf club with traditional golfing values. The staff are a great asset here, hundreds of them running around diligently doing their job – turn up really early and you will see them mowing the lawns in the dark with headlights on, ensuring that the course is in its usual immaculate condition. The clubhouse includes an excellent restaurant, plush locker rooms, swimming pool, gym, squash courts and snooker tables, and is a great place to spend some time being waited on hand and foot after a round. It also retains a tradition vibe – you can’t use your phone in the main lounge, which somehow adds to the old-school feel of the place. If you get the chance, a round on the Old Course at Royal Selangor Golf Club comes highly recommended. Note: this is a walking only course. 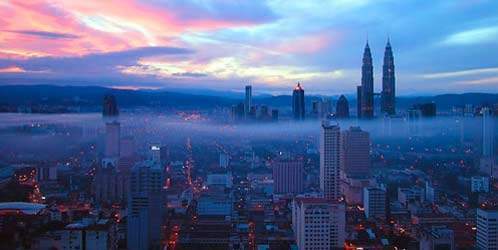 Suajara’s stunning second course is a match for any in Malaysia. A genuine must-play that justifies the green fee. 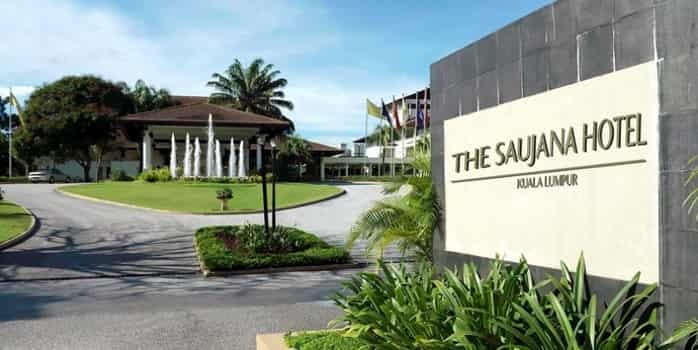 Saujana Golf & Country Club is one of the premier golf club’s in Malaysia and features two 18 hole championship courses that have hosted some of the world’s top professionals playing in a number of prestigious tournaments. The Bunga Raya course, otherwise known as ‘The Crocodile’ for reasons that are not entirely clear, is the second course, but at no point on your round will you feel like you are settling for second best. This is a beautiful course. The views from the elevated tee boxes on the 1st and 10th are spectacular, and watching your drive soar down into the lush greenery in front of you is a great way to start the round. There are plenty of elevation changes that give the course character and test your reading of distances. The 9th swoops down into a valley and up again to the green, and the par-3 13th has an extreme drop from tee to green which makes picking the right club something of a lottery. It’s almost better to lose the previous hole and cede the honour to your playing partner. The fairways are fairly generous and a lack of OBs invites you to grab the driver. Not that that means you can’t get in trouble. In fact, there is plenty of jungle which many courses would designate as OB but here, you are free to try to escape. Take our advice and stay out of the jungle. The challenges on the par-5 closing hole are more water based. Your tee shot has to find a narrow peninsula in a massive lake. If you get a good drive, the temptation to go for the elevated and sloping green across more water will be hard to resist. Get it wrong and you will find sand. Many a round has been sadly derailed at the demanding, yet hugely enjoyable final hole. Our visit was the day after some heavy rain and consequently the fairways weren’t in quite the immaculate shape we might have hoped for – a little mud and some tyre tracks from buggies taking away slightly from the perfection of the lies we found on the dryer sections. However, these problems were not overly prevalent, and only really stuck out in comparison to the general excellence over 99% of the course. No such qualms with the greens, which were super-quick. Getting down in regulation is a real challenge, particularly as the putting surface is so deceptive. You will be grateful for the caddy’s advice, as going it alone can be costly – it’s all too easy to putt the ball off the green! The rough was equally tricky, tenaciously holding on to your ball and making any progress beyond 50 or 60 yards some sort of achievement. The grass around the greens also provides surprisingly little roll, so bump and runs are swiftly abandoned in favour of the more successful tactic of taking a higher angled club and trying to land directly on the putting surface. There are some little touches that elevate this course above the usual experience. In addition to excellent caddies with excellent knowledge of distances and a keen eye for the breaks on the green (which is a godsend), the golf carts come equipped with GPS so if you have any doubts about the distance the caddy quotes you can double check on the hand map of each hole. Uniquely for Malaysia, and handily for those of us from Europe, distances are in yards. Overall, minor fairway issues aside, it’s hard to improve on the experience of a round of golf at Suajana Golf & Country Club. 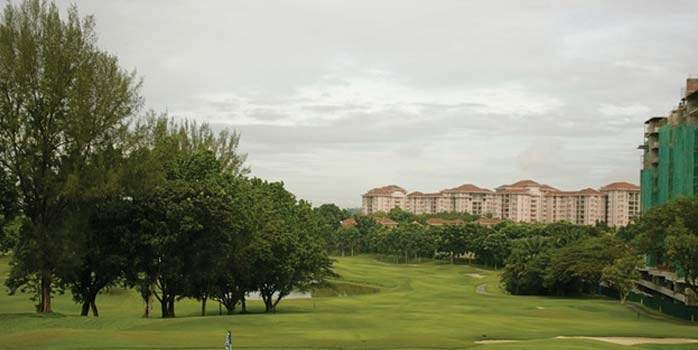 The 2010 renovation has restored this course to its rightful position amongst the very best courses in Malaysia. If you’re looking for the best of the best, you’ve come to the right place. Simply stunning. On the rolling hills of a former oil palm estate is the regular host of the Malaysian Open and perhaps the premier golf course in the country – the Palm Course at Saujana Golf & Country Club. Locally known as ‘The Cobra’, it is widely acknowledged to be the toughest course in Malaysia thanks to its tight, palm-lined fairways and devilishly fast greens. This is a course with bags of character, and every hole feels like a mini-adventure that requires a lot of thinking to get through. It really looks the part too, and it’s easy to imagine the water, hills, trees, jungle and impeccably maintained playing surface looking amazing on TV. The rolling nature of the terrain means there are plenty of elevated tees from which to enjoy the stunning views. Playing to your handicap here will be a real challenge. The beautiful but vicious par-3 2nd may only be 172 yards away, but your tee shot must cross a ravine, anything short means either ending up in a bunker or your ball running down the 45 degree slope into the jungle. Anything long and you’re in for an adventure as the terrain drops away sharply behind the green. Getting any recovery shot to stay on the lightning quick putting surface is very very hard. The monster par-5 that follows features a double tiered, elevated green where putts are subject to almost imperceptible breaks. Getting down in three is an accomplishment, let alone two. WIth this in mind, it gets tempting to try going for greens in under regulation, possible for long hitters on the extreme dog-leg par-4 17th. The penalties for failing can be severe, however. The undulating fairways are immaculate, and the greens fast enough to have any golfer in the world second guessing themselves. A slight touch can often be enough to send the ball to the outer limits of the fringe, and three putts can easily become depressingly regular. The rough will tenaciously hold on to your ball so is best avoided if you want to stand a chance of making the green. The excellent course maintenance that provides all this is matched by caddies whose experience and knowledge is invaluable, especially on the deceptive greens, and clubhouse facilities that are world-class. 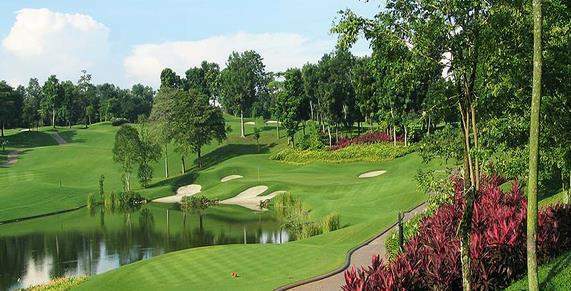 If you want the best of the best, book a round on the Palm Course at Saujana Golf & Country Club. A premium course with the best fairways in the country; avoid the 3rd nine in favour of 18 memorable championship holes. 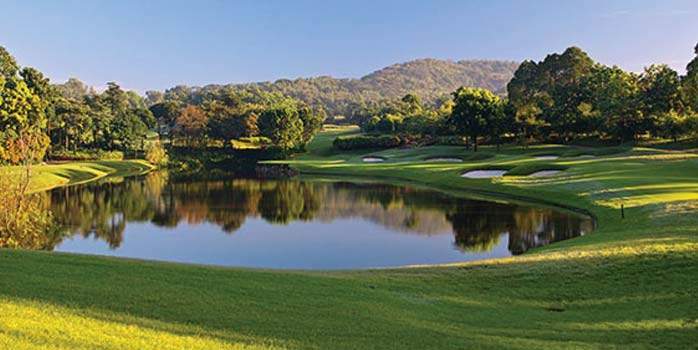 Built on the site of a former rubber plantation back in 1993, the 27 holes of Tropicana Golf & Country Club wasted no time in establishing themselves amongst the best Malaysia has to offer. This is more true of the 18 hole West Course than the slightly disappointing East Course, which does not quite live up to the delights of its sister course and should therefore be avoided. The West course is in immaculate condition. If you’re looking for an example of how fairways should be, look no further. The perfect carpet of Bermuda grass is without equal in the country and is surely a match for the best courses in the world. Furthermore, the excellent macro- and micro-drainage systems ensure that the course remains playable in the face of heavy rain, and sophisticated irrigation systems ensure that the playing surface remains in tip top condition during the dry season. The rough isn’t too thick, allowing plenty of scope for recovery after a poor drive, and the bunkers are perfection, with soft white sand that isn’t packed down too hard. The greens are in excellent condition too, albeit slightly too inconsistent to be rated as immaculate – some played a little slower, some a little faster, which can lead to a frustrating day with the putter. There are a number of memorable holes. The 1st requires you carry a lake to the left to a smallish green, and the 11th which plays from an elevated tee with the rest of the course itself providing a stunning backdrop. As your drive soars into the sky, time seems to stand still as it takes an age to fall back to earth. There are plenty of bunkers to keep you on your toes, and enough elevation changes to keep things interesting. The fairways are fairly narrow, the trees that line them can cause all sorts of problems, but the rewards for finding the short stuff are great, as your ball will sit up invitingly. Overall, this is a must play course. It’s in immaculate condition, with probably the best fairways this side of Augusta, and it proves to be an absorbing challenge that will leave you wanting more. 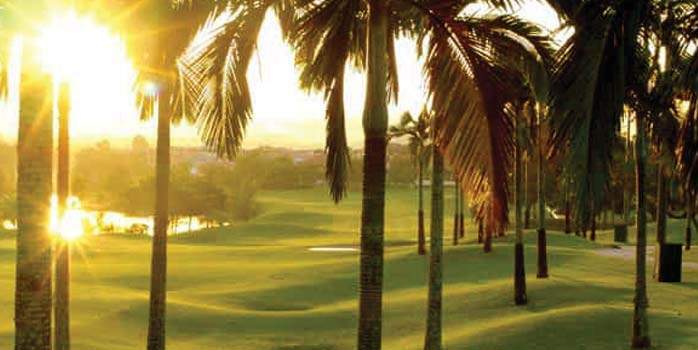 Don’t let that tempt you in taking on the vastly inferior nine holes of the East course; stick with the West, and a hugely satisfying day of golf is practically guaranteed at Tropicana Golf & Country Resort. 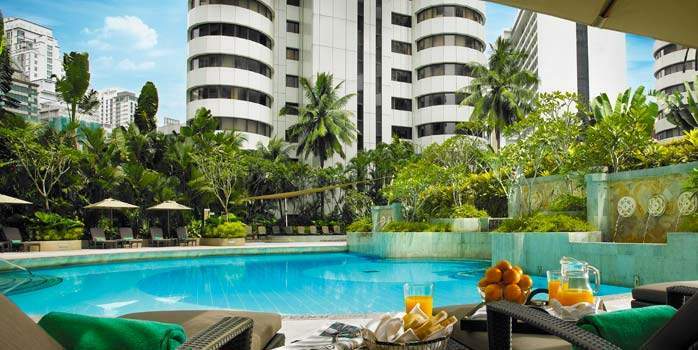 Located within the vibrant heart of Malaysia’s capital city, this five-star hotel combines uncompromising quality and care with access to a unique spectrum of enriching experiences. Nestled among a series of hills and palm plantation, the Saujana is set on a 160-hectare lush tropical garden and fringed by two 18-hole championship golf courses. Wake up in Malaysia’s vibrant capital city with a serene view of the beautiful gardens and Kuala Lumpur Tower.